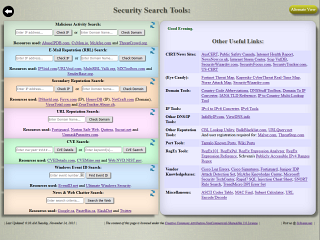 This site hosts a plethora of online resources that are useful for network security professionals. I started this as a project for work, but it grew in complexity and usefulness. When investigating traffic or websites, you can use these tools to research the historical reputation of the service in question, thereby allowing you to better judge their legitimacy. I combined the best security reputation tools on one page, so that you can check multiple resources, simultaneously.